Mark Grotjahn’s paintings and drawings are light-hearted takes on geometric abstraction.Many of his works use his “butterfly model” of skewed perspectival lines. These images conjure both infinite transcendence and the graphic design of book covers or psychedelic posters. Additionally, by referring to these pieces directly as butterflies, Grotjahn complicates the initially abstract appearance of the works, but without allowing them to completely become representations of their namesakes either. 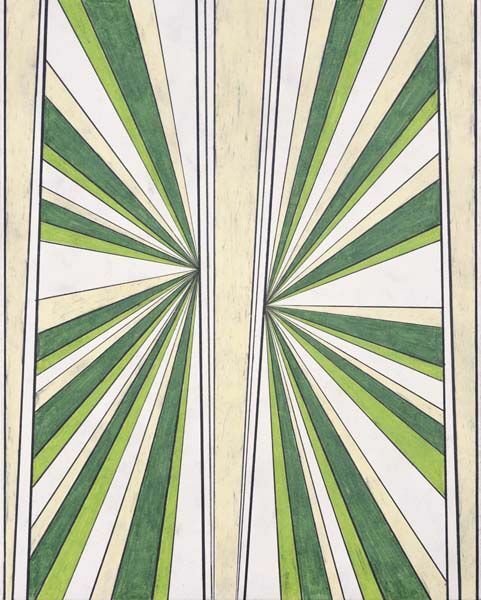 Mark Grotjahn’s paintings and drawings are light-hearted takes on geometric abstraction. Many of his works use his “butterfly model” of skewed perspectival lines. These images conjure both infinite transcendence and the graphic design of book covers or psychedelic posters. Additionally, by referring to these pieces directly as butterflies, Grotjahn complicates the initially abstract appearance of the works, but without allowing them to completely become representations of their namesakes either.